State Flags are offered in several fabric types. Below is a description along with specifications of the various types. ENDURA-GLOSS MOUNTED FLAGS - Beautifully printed on silk-like material these flags offer the highest quality in a mounted flag. All four sides are hem stitched to provide a longer lasting flag. 4" x 6" flags come mounted on a 3/16" x 10" black plastic staff, 8" x 12" are mounted on a 1/4" x 18" black wood staff and 24" x 36" (classroom size) are mounted on a 7/16" black wood staff. ENDURA-POLY MOUNTED FLAGS - Beautifully printed on lightweight polyester material these flags offer exceptional quality in a mounted flag. All four sides are hem stitched to provide a longer lasting flag. 12" x 18" are mounted on a 5/16" x 30" natural wood staff. NYLON OUTDOOR FLAGS are made of 100% heavyweight 200 denier nylon specially treated to resist sun and chemical deterioration. These flags are extremely durable and fast drying. All outdoor flags are finished with a strong durable white header and brass grommets. ENDURA- POLY OUTDOOR FLAGS - Beautifully printed on lightweight polyester material these flags offer the most economical state flags. All four sides are hem stitched to provide a longer lasting flag. They fly in the slightest of breezes and offer superb color retention. All are finished with a strong white header and solid brass grommets. POLY-MAX OUTDOOR FLAGS - These are the most durable of all flags. Made of 2 ply 100% polyester bunting. This material resists wear to wind, dirt and abrasion better than any other material. This type flag is highly recommended for use where the flag is flown every day such as institutions, businesses, schools, etc. It is the longest lasting flag available. Any outdoor flag can be modified for use as an indoor or parade flag by adding a pole hem and fringe. 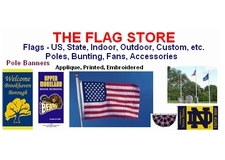 See a listing on this site for pricing on adding a pole hem and fringe by size of flag. If the size or fabric you are interested in is not shown - please call 610-584-4996. FDFriendly is a supplier of custom flags and banners and your flag can be created to your specifications.